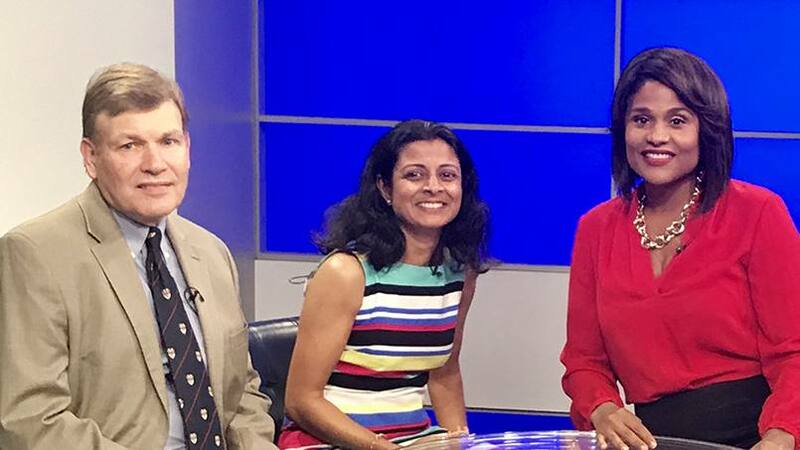 Left to right are David Miller, M.D., Urvashi Patel and Melanie Lawson of News 4 Jax. Thanks to the immediate care she received at Mayo Clinic, 42-year-old Urvashi Patel is living proof that a stroke can happen to anyone at any time. It started with a headache. On her way back from the bathroom one morning at work, Urvashi Patel was struck with head pain unlike any she'd experienced before. "It was bad," she tells us. "Really bad." Back at her desk, Urvashi sat with her head in her hands waiting to see if the pain would pass. She steadied herself long enough to carry out a 30-minute conference call, during which she had more symptoms. "I started getting a tingling feeling in my fingers, and I remember reading somewhere that's something you shouldn't ignore," she tells us. "Especially for women because it could signal a stroke, heart attack or something else like that." At that point, Urvashi started thinking about Sherry Pinkstaff, a research collaborator at Mayo Clinic's Florida campus who, at the age of 39, had suffered a stroke. Urvashi works with Sherry's husband and was familiar with the details of her story. But as with Sherry, nothing like that should have been happening to Urvashi. In her early 40s, she was by all accounts a picture of health. "I'm honestly probably more health conscious than the average person," she tells us. "I'm a vegetarian, not obese, no diabetes or cholesterol issues, and actually, I have low blood pressure. I'd also started exercising regularly." Yet here she was, experiencing symptoms she knew were not just abnormal, but intensifying. After the conference call, Urvashi headed to see the on-staff nurse where she works. She realized something was seriously wrong. On that short walk, she dropped her cell phone three times. At the nurse's office, Urvashi was asked to make both of her hands into fists. "I couldn't undo the fist in my left hand," she tells us. "The nurse said, 'I think you might be having a stroke. We need to get you to a hospital.'" Urvashi was taken by ambulance to Mayo Clinic, where David Miller, M.D., and the team at Mayo Clinic's Comprehensive Stroke Center were awaiting her arrival and confirmed she was having a stroke. Dr. Miller knew they were in a race against time. "If people are having a stroke, your deficits start immediately, so the damage is from whenever the blockage occurs," Dr. Miller tells Jacksonville's News 4 Jax. "'Time equals brain' is an equation that we talk about, and it's very, very, very true." The team at Mayo's Stroke Center quickly did preliminary testing before taking Urvashi to the angiography suite, where Dr. Miller says they were able to "reconstruct her artery, remove the clot, and restore brain function." That set Urvashi up for what she tells us has been a nearly full recovery. "I still have some balance issues and a lot of fatigue, but that's not bad, and everything else is pretty awesome," she says. "I feel very lucky that I was able to recover in a matter of months rather than years." For that, Urvashi credits her care team at Mayo Clinic and the fact that she took her initial symptoms seriously. It's what she wants others to take away from her story. "Don't ignore symptoms," she says. "Get help quickly because time really is of the essence if you're having a stroke." You can listen to more of Urvashi's story here. Then let us know what you think by sharing your comments below before using the social media tools atop this page to share this story with others.